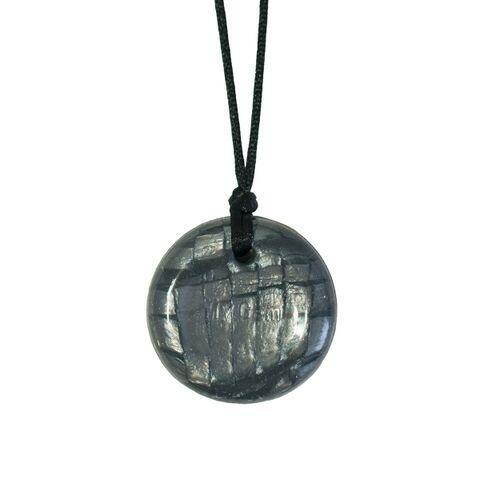 The Disc is a classic round shape pendant that is certain to soothe that need to chew! Shimmery pearlized circle of gorgeous. It's classic shape and smooth texture is great for fidgety hands too. It is approximately 2 inches in diameter and 1/2" thick. Due to the manufacturing process, slight color variations may occur. CHEWIGEM® is designed for mild to moderate chewers. Due to the intended use of the product, wear and tear are expected and products should be checked routinely for damage and used with adult supervision. Discard and replace immediately once damaged. Necklaces are not intended to be worn for children under age 3 due to the concern of long cord strangulation. Clasps and ties contain small parts and may be a choking hazard and are not intended for chewing. This is not a toy. NOTE: Chew products are not returnable. Its definitely exactly as described. My son just does not seem very interested in its texture. It is just not stimulating enough for him.